Star Wars: The Last Jedi has quite the cast of dark side characters. Adam Driver leads the way as Kylo Ren. But we also have Gwendoline Christie as Captain Phasma, Andy Serkis as Supreme Leader Snoke and of course Domhnall Gleeson plays General Hux. 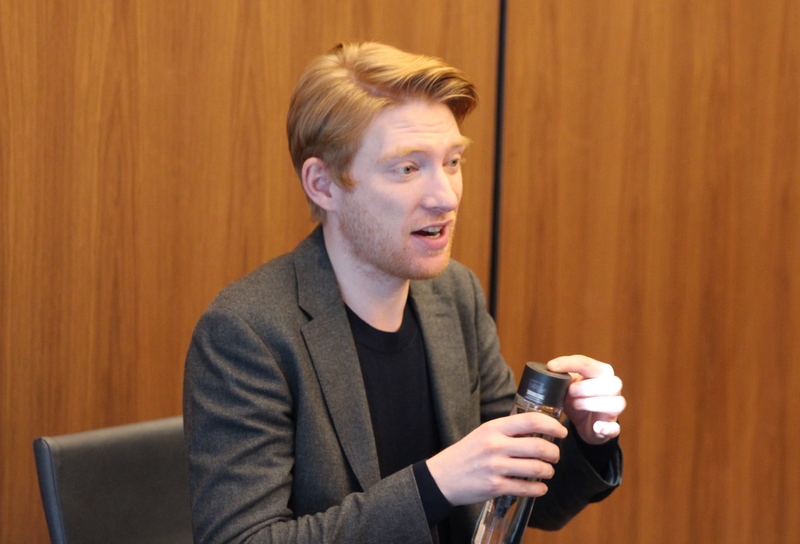 Returning to the role he debuted in Star Wars: The Force Awakens, Domhnall is very familiar to large franchise movies. 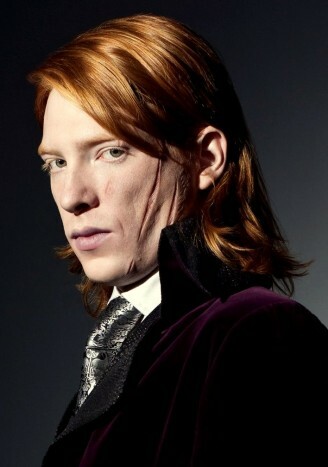 He played Bill Weasley in the Harry Potter films. So he’s used to the craziness of movies with an obscene number of fans. However, he still likes to experience it all as “normal” as possible. 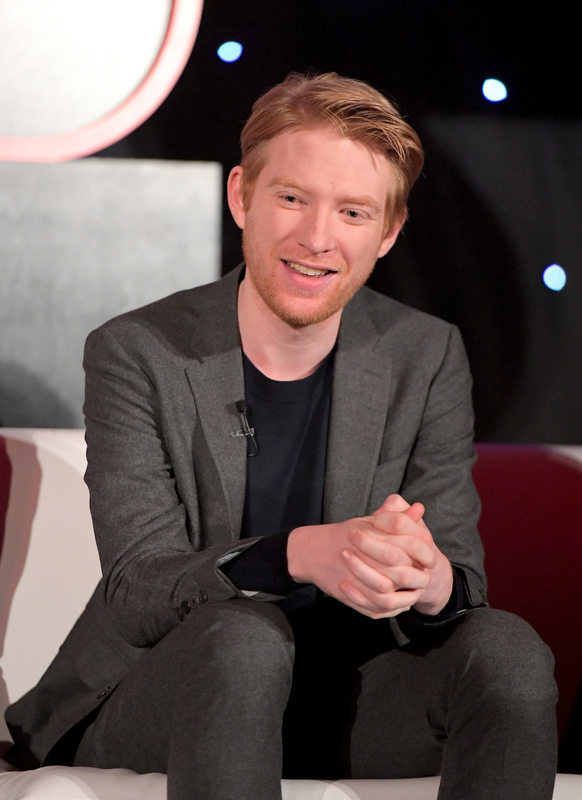 As Domhnall Gleeson walks in the room, we all applaud. You know I’m not Cate Blanchett, right? (Laughing) I know, I know, I was just talking about that. I used to get called Cate all the time when I was nineteen. 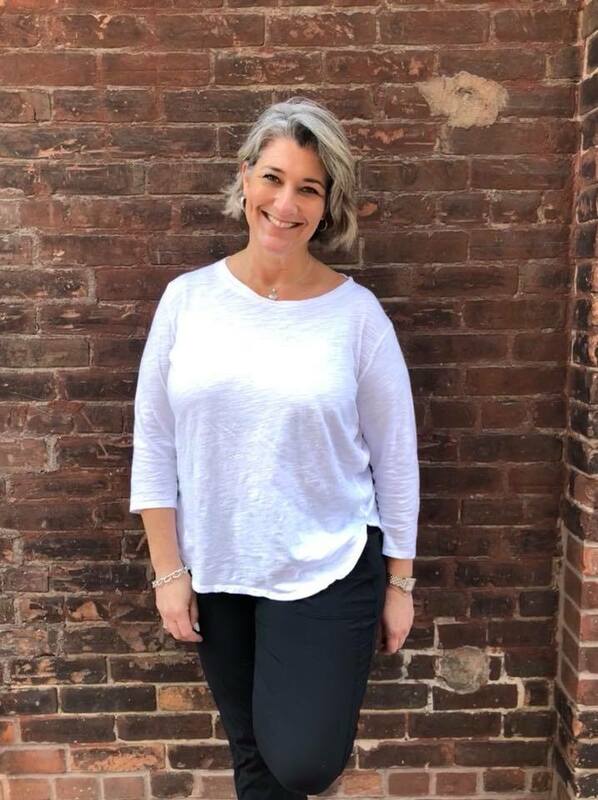 ‘Cause I look like her… How are you doing? So you didn’t watch the film yet? No, they had a screening for the cast, and I think it was the right idea. I decided I would rather see it with like two thousand people who don’t know what’s going to happen. Just the feeling in the room of like, cause at the Force Awakens, that premier was insane. I was there with my dad and my friend Lawrence. Like what the hell is going on. Like, whoops and cheering and big gasps and everything. I didn’t want to miss out on that being my first experience with the film, so I’m waiting until whatever day it is next week. Yeah. So, we rode Star Tours last night; all of us. And we got to see you in that, and I realized, that’s not your first theme park ride. What is that like, being in multiple in multiple theme park rides. At Disneyland. It’s down the road. And there’s also one in Orlando too. Ah, ‘cause I always think of Orlando. Ah, okay. Oh, I’ll have to go. And so, yeah, no it’s cool. It’s cool. Like, being part of two different rides that, like, literally millions of people will go on is kind of ridiculous. But, in a way, it’s no different than the films. Like, so many people are going to see Star Wars that it’s a bit nuts. The whole thing is a little bit nuts. It’s good though, I think. So, if you had a lightsaber in real life, what color would it be? I do have a lightsaber in real life but it’s not, it’s just one of the plastic ones, (Laughing), and it’s red. So, yeah, when I went to one of the premier things last time around, Harrison Ford was there, and they were giving out these plastic ones to the fans, and I picked a green one ‘cause I’m Irish. And then, we were at the thing and just Harrison Ford’s like the coolest man in the world. So I was, like, talking to my agent and I was kind of waving the thing around, and I saw Harrison Ford was looking over at me, and I was like, oh, (laughing). So, yeah, I got my photo with him. That was super cool, and- but yeah, so I’ve got a red one and a green one. So, you know what I mean; mix and match, depending on my mood. Can we say that Han Solo is your ultimate, favorite character in Star Wars? Can you say that? Eh, I don’t know if I’m allowed to say that. See, when I was a kid, I was like an Indiana Jones kid. More than Star Wars even. So that was like my childhood was Harrison Ford in a different movie. And by the time I kinda came up then, the prequels were coming out, and I saw them in the cinema, but I’d never seen the original trilogy, any of them in the cinema. I just missed it. And then my big experience was when I was deciding whether I could be in the Force Awakens, JJ (Abrams) gave me a file of the original Star Wars, and I watched it on a big screen. And that was, like, yeah. So that was like, amazing. And then, yeah, then they all became my favorites. How diplomatic is that? They’re all my favorites. Yeah, but I do love Han Solo, yeah. So, being Irish, what do you feel about Star Wars going to Ireland and filming there? I love it. And I love that the people who went there had an amazing time. I love that they got good weather. I love that they were all the way up and down the west coast, and Ireland is my home, I think it’s the best place in the world, and I’m just happy for people to see it. It’s an intensely beautiful place, and they got to see it in beautiful weather, which is ridiculous. That never happens, (laughing). So when they came back, and they were all talking about what a good time they had in Ireland, even though I had nothing to do with that, I have to say I was pretty, pretty proud, yeah. You said you watched all the films. 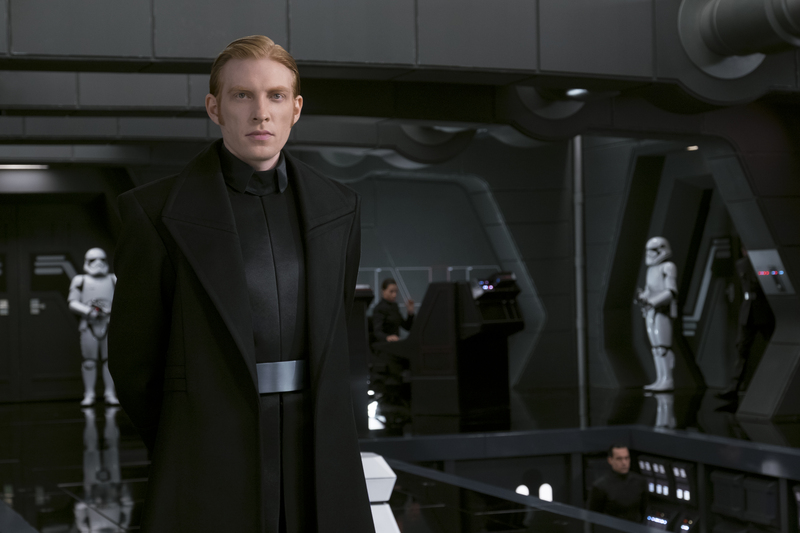 Did you take anything from past villains and bring it into General Hux? You can’t steal, right, but like obviously his place in things at the beginning of the film is like Peter Cushing’s kind of role. That’s kind of, like, in terms of just the scheme of the way the villains are set up. He would be kind of fulfilling that role a little bit, so the wat the Peter Cushing, just that very clipped English accent I liked for that. But then you have to go to the real world to find you influences. ‘Cause you can’t take your character notes from other characters. I think you want to base it on something that’s real. You know, that you can kind of look into, so I understood where he stood in things, but no, the influences would have come from elsewhere. And also just about how he’s got to fit into the story. 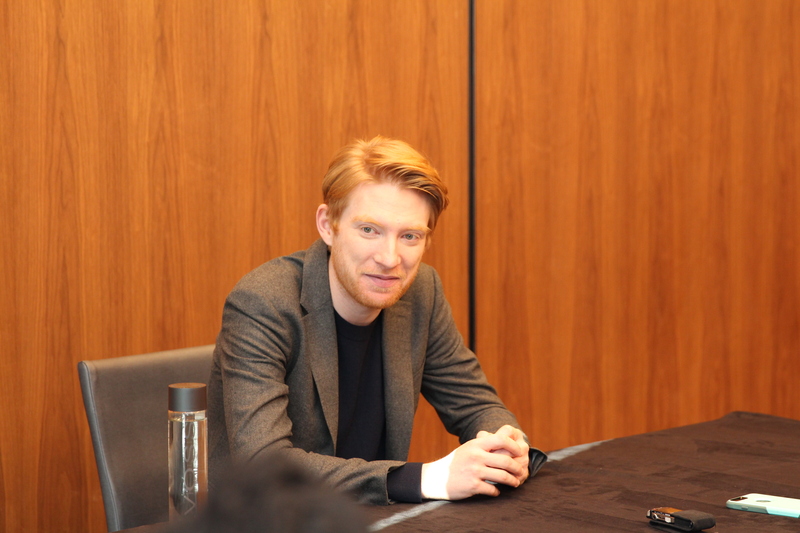 That was a real process with JJ of understanding the most interesting version of Hux, which is not there from the very beginning. That is the one that’s very dysfunctional with Kylo Ren and battling for their place in things. And for favor from Snoke. That ended up, finding that along the journey, as opposed to it being there from the very beginning. Can you tell us a little bit about your character arc in the first film versus the character arc in this film? No. (laughing) The character arc in the first film, he goes from a very good place to a very bad place concerning his standing in things. I think it’s pretty obvious. He wants his place on the throne. 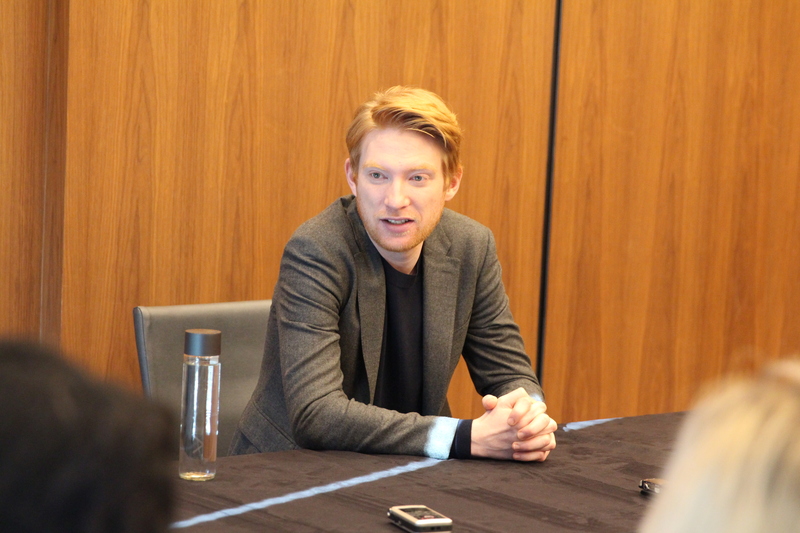 He wants to be in charge of Kylo Ren as an opposed to whenever Snoke goes, that’s what Hux wants. And so that’s what he would like. But he’s in a really much worse place at the end of the first movie than he was at the beginning in terms of achieving that goal. And that’s where we start the second movie, so, just regarding an arc, you’re just starting the character in a much worse place. A much more desperate place, much more uncomfortable place. I think that’s a good place to put somebody like Hux. Taking a step back from him and thinking objectively, you want Hux to suffer. That is what you wish for somebody like that, who behaves like that, and who carries himself like that. And I liked creating somebody that that would end up being the feeling you would have for him. So we start with a place where we’re ready to see him suffer. Now, in the first film, we saw that you channeled a lot of inner rage. How did you channel this for yourself and ultimately find the character that you wanted to portray? I think, even less than, or more than rage, I think there’s a desperation about him, which is very unbecoming. There’s a need at all times to make sure that everybody knows that he’s important; that they should do what he says, that he deserves his position in things. But he knows that he’s not as powerful as Ren, really when it comes to it. If it came to a first fight, he’s dead within ten seconds. And Ren wouldn’t have to use his fist. He’d just like force choke him or whatever. So that’s where he is at all times. You just put yourself in a desperate place, and then say, right I’m getting rid of that. Now I’m pretending that I’m powerful, even though something in there is worried that you’re not. I think insecurity is where he, those are not solid foundations, you know? And that’s where we tried to start him from. Is there ever a moment on set where you had a geek-out moment, like, oh my gosh, I’m in this. Oh my gosh? That’s so polite, (laughter). I use different words. Yes, there are. There are lots of moments like that because of the scale of things. Because of how much Star Wars means to people. Just the history of it. I mean, there aren’t many. Harry Potter was a huge journey. Those films were over ten years or something like that, you know what I mean? This has been going on since. There are so many things which are part of growing up, which are part of people’s childhoods. Star Wars would have been the first movie that a lot of people, you know what I mean? Like all those things. There’s just something that’s a position of privilege, so loads of moments like that. Anytime, without giving anything away of who I worked with on this or didn’t work with, but when you’re on set, other people have to come on set to show Rian a costume in person, or, you know, to talk to him about something. So the days when you don’t know somebody’s gonna be in, and you’re kinda talking to Rian about something and then Mark Hamill just stoles up in his Luke Skywalker gear, you’re like what the f- (laughing). You’re like, oh my gosh! (wink) Those moments, when you’re not expecting them. He’s there on a Star Wars set and you’re like, what are you doing in the evil place? Why are you hanging out here, and it’s like, oh he just here to see Rian. Like, those things are kind of amazing. Those where you pinch yourself. What is it like to be sitting in a room full of people who have not seen the film? You have to be careful what you say. I can’t even imagine how difficult that must be. It’s weird, right. That is another reason it was good for me not to watch the movie because I would have spoiled it for all of you already. My mother has form in this regard. She is the worst person to give away the endings of movies, so I try and make sure I don’t put myself in that position. It’s odd. It’s really easy to say nothing. It’s really difficult to say a little but not too much. And that’s where we exist in this week. Because all the way up until now, we’ve been allowed to say nothing. And now we are expected to say a little. And that’s much harder. Do they sit you down and say this is all you can do? No, there is an understanding. Like, we know we can say nothing, (laughing). And then some of us are a little bit more blasé with that than others. Oscar just roles with it, and I’m like, I wish I could do that, but I’m just worried I would give away the whole ending. So now I shut off. You can’t tell anyone. Okay, so how does it end? I’m not telling you how it ends. No, I won’t, (laughing). See, that would ruin the press event. Obviously, in Harry Potter, you were in Gryffindor, on the good side, and now you’re playing a villain. Which, which do you tend to side with more personally? Are you light or are you dark? We all have our dark moments, you know, everybody has those, and those moments when you remind yourself that you should be a person than what your instinct to do is or whatever, that there are other people. Hopefully, I’m not that bad about remembering that the good of the people is more important than the good of your own thing. These days are getting trampled all over all over the place. I’ve never killed anyone, (laughing). Yeah, you just start there and work backward. So, when you were describing Hux, it does sound very similar to the current climate. So how much does Star Wars, and not even just this movie, but how much does Star Wars really kind of reflect our times in which we are living? This will sound like I’m hedging my bet right, but like, most pieces of great art reflect something about the times you live in, no matter when you live. And I’ve heard that this film is particularly, you can do whatever you want with it regarding it being contemporary and relatable to people and all the rest of it. I think that there’s never a lack of evil or not evil. Never a lack of bad intention in the world. And people only out for their own interest and the interest of the few. That’s been around forever and will always be around. That’s not gonna disappear. So I think you can just compare it to anytime, but obviously, what brilliance of Star Wars is that when you watch it you can be entertained by the dark side, whereas in real life, that isn’t entertaining, that’s terrifying. Different. 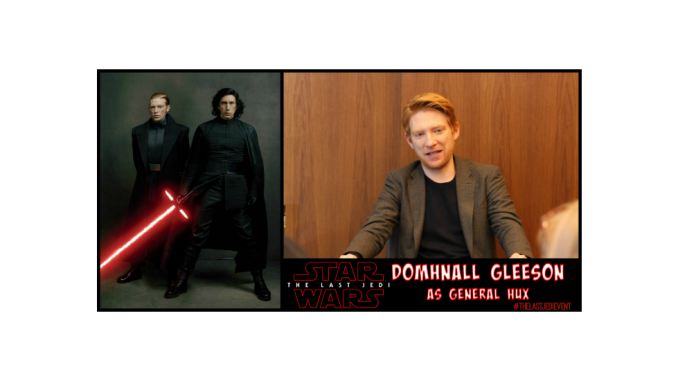 Hey Buddy!, I found this information for you: "Domhnall Gleeson Plays General Hux". 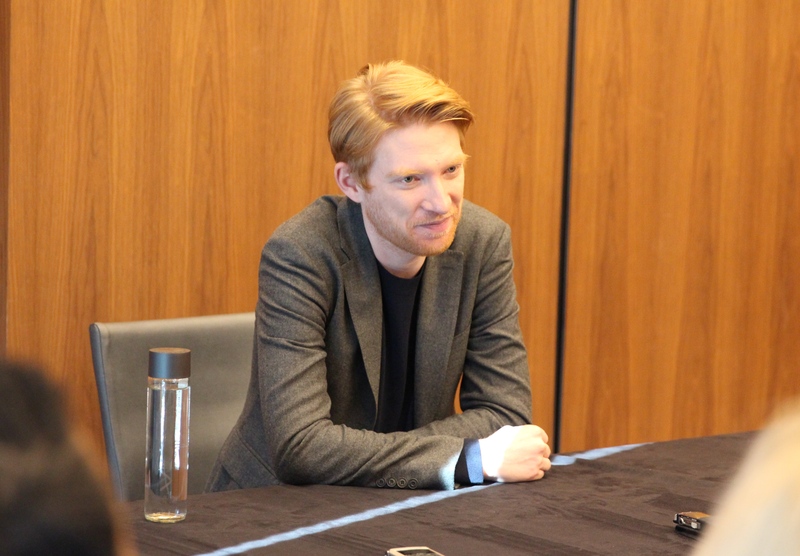 Here is the website link: https://www.trippinwithtara.com/domhnall-gleeson-plays-general-hux/. Thank you.